Can you see the imaginary overalls? I’m always amused at how serious the Haggis looks in some pictures; we tend to think of him as an earnest goofball. We thought we might submit this picture for his entry in the 1998 Cairn Terrier in America book noting his Senior Earthdog title but it didn’t reduce to tiny size and black and white worth a darn. 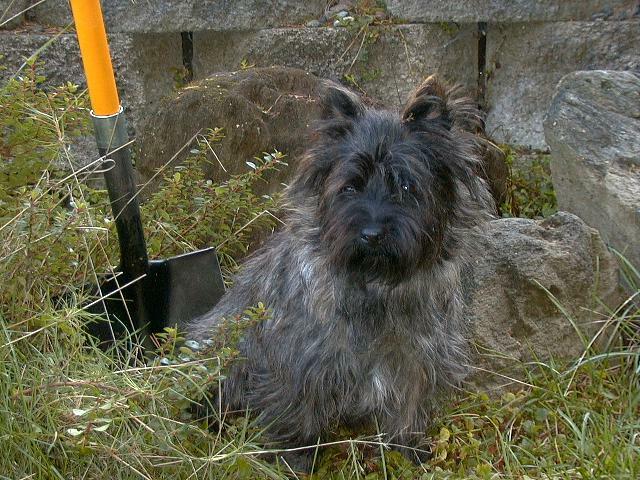 In May 1999, Haggis earned his Master Earthdog title, becoming the fourth cairn to do so (following in the muddy footsteps of his litter brother, Geordie).